Rev. Msgr. John Kozar, a priest of the Diocese of Pittsburgh, PA, was honored on 1 August with the Distinguished Alumnus Award, at the annual Saint Meinrad Alumni Reunion. He graduated from Saint Meinrad College in 1967. Msgr. Kozar is president of Catholic Near East Welfare Association (CNEWA) and the Pontifical Mission for Palestine. On behalf of the Holy Father, Msgr. Kozar oversees the Catholic Church’s aid to Christians in the Near East and Middle East — about 16 countries. He attended Saint Meinrad High School and College, graduating in 1967 and continuing his seminary studies at St. Mary’s Seminary in Baltimore, MD. He was ordained a priest for the Diocese of Pittsburgh in 1971. Then-Father Kozar spent the early years of his priesthood as an associate pastor at various parishes in the Pittsburgh Diocese. In 1978, he was named the development coordinator for the diocese’s mission office, making yearly pastoral visits to the diocese’s mission in Chimbote, Peru. He also worked from 1987 to 2001 as pilgrimage director for the diocese, from 1995 to 1997 as vicar for clergy, from 1995 to 2001 as diocesan director of the Pontifical Mission Societies, and from 1997 to 2001 as director of the Diocesan Jubilee Office — while simultaneously serving as pastor of several parishes. Since 2011, Msgr. Kozar has been leading Catholic Near East Welfare Association, where he oversees the organization’s mission to support the Eastern Catholic churches, provide humanitarian assistance, promote Christian unity and interreligious understanding and collaboration, educate people about the churches of the East, and offer pastoral support to seminaries and religious orders. He becomes the 26th Saint Meinrad alumnus to receive the Distinguished Alumnus Award. 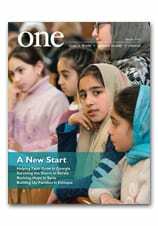 In the June 2017 edition of ONE, journalist Don Duncan writes about the ways Catholic schools are changing lives in India. He adds some additional reflections below. Time and again throughout this reporting trip, I’ve been reminded of the importance of education. Kerala has the highest literacy rate of all the Indian states, at over 90 percent of the adult population. Many factors have contributed to this achievement, including the government school system and NGOs. However the contribution made by the church and its many educational establishments is seen as the indispensible factor in the creation of this highly literate population. All over the state, you see people reading books at bus stops or perusing the day’s newspaper at teahouses. But this literacy statistic can be deceptive. Education remains a constant, perpetual battlefield. The fight never stops because every new generation that comes along needs to be educated; in order to garner people’s commitment to education, its benefits need to be immediately clear, not only to every student but also to his or her parents too. Education is a very tough sell in the rural, mostly agricultural, areas of inner Kerala. People living by subsistence farming need their children to help them work the fields to assure the family’s food security and livelihood. It’s difficult to persuade people living such a hand-to-mouth existence to make education a priority. For many of them, education does not have the immediate pay-off that having their children work the fields does. In this sense, for people living day-to-day on the edge of poverty, the benefits and worth of allowing their children to attain a good education is a near total abstraction. It reminds me a little of my frustrations with democracy and party politics in the four-year electoral cycle. Politicians wishing to be reelected focus almost exclusively on projects and initiatives that can come to fruition in the four years before they stand to be reelected. Anything that takes longer has less or no political capital for them and so, in this kind of political system, broader, deeper and important reforms often get sidelined. Some of these projects, much like the process of educating a child, require a much longer cycle of commitment. The fruits of such a commitment, and the human capital it produces, are significant. In rural Kerala, children’s homes run by the church are offering the possibility of a full education to children who would otherwise have left school at age 10, if not earlier, and worked their parents’ fields. It is in the cases of children like these that one can see the utter transformation that education can bring. Children who leave their homes young and are taken in by the religious sisters for the duration of their education often return years later to their villages with skilled professions; they come back as teachers, bankers, doctors, etc. These children-turned-educated adults are the living products of what education can do and they are now serving, in their own respective communities, as extremely compelling arguments for the value of education. I met three such success stories from various church-run children’s homes across Kerala. But a childhood spent under the care of sisters is not all Deepu Sasidharan, Devika Narayanan, and Shilpa Joy have in common. These young adults are not only shining examples of the positive effect of education; their intimate familiarity with poverty, family dysfunction and child vulnerability, when put through the prism of education, has left them all with a keen sense of social justice and a burning mission to make it part of their respective professional practices. While the ability of education to improve one’s financial and social standing may be the most apparent and compelling result of education for those who are living in poverty, education of course comes with many other benefits. It can help women empower themselves more and take better care of their children. Education can help men take better care of their wives and children. Education establishes a clear scientific underpinning to one’s sense of health and well-being. As the number of educated children returning to their villages grows, it is hoped that through leading by example, these numbers will produce a gradual “snowball effect” whereby people, inspired by the example, send their own children to school. If this happens, Kerala’s rural communities are in for some major positive change — not only in terms of poverty reduction but also in terms of gender rights, children’s rights, agricultural practice, money management, local governance, healthcare and, really, every other aspect of life. Read more about The Secret of Their Success in ONE. A heat wave in Israel and the Palestinian territories in July and near-record electricity usage — where it was available — are indications that, despite the continuous political tensions here, Christians, Muslims and Jews are facing a common enemy that needs to be confronted in a united manner. “This means something has changed ... climate change is something which touches our lives,” he said. In this photo from June, a Palestinian boy stands outside his house at a refugee camp in Gaza City. New statistics show child labor is increasing in Gaza, as the economy continues to deteriorate. 250,000 people have returned to the Nineveh Plain in recent weeks.